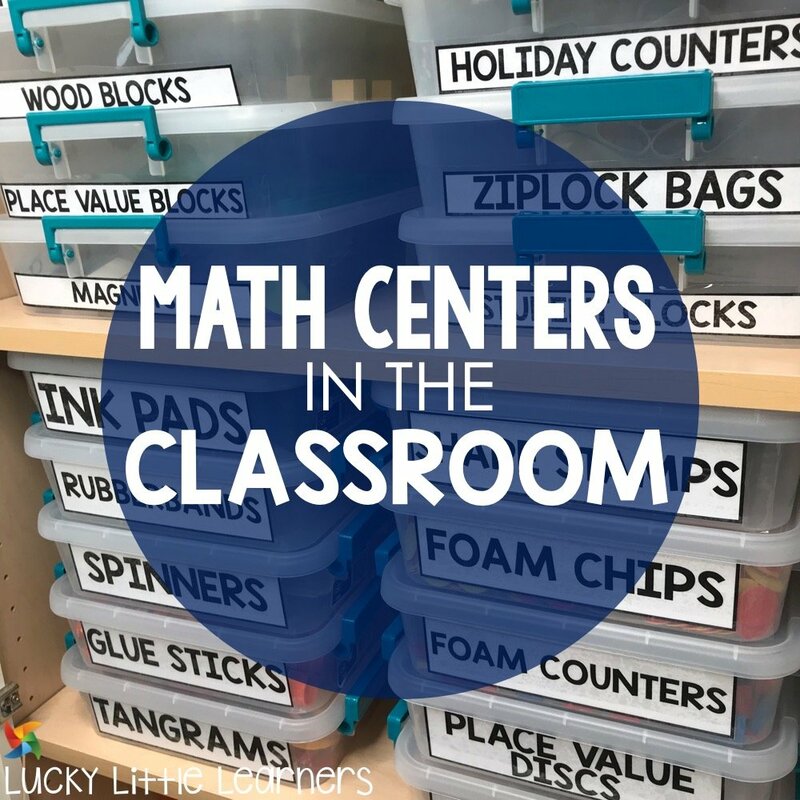 How do math centers look in your classroom? Ideally, it’s a time for students to work independently on a differentiated task while the teacher is working with students in a small group setting. 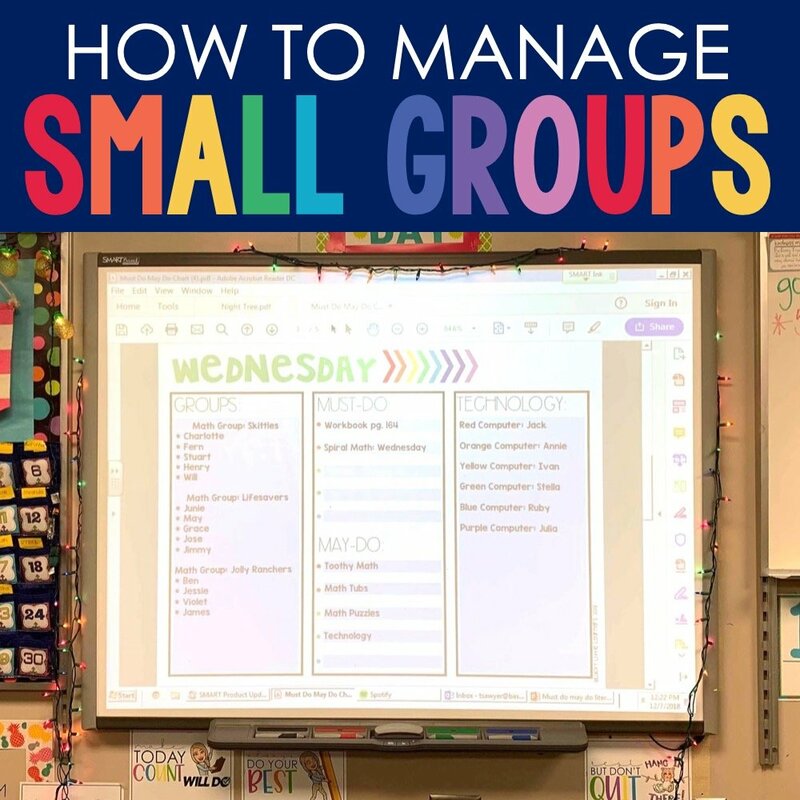 Of course, there is a lot more to it such as student questions, accountability, organization, flexible groupings, guided support, and so much more. 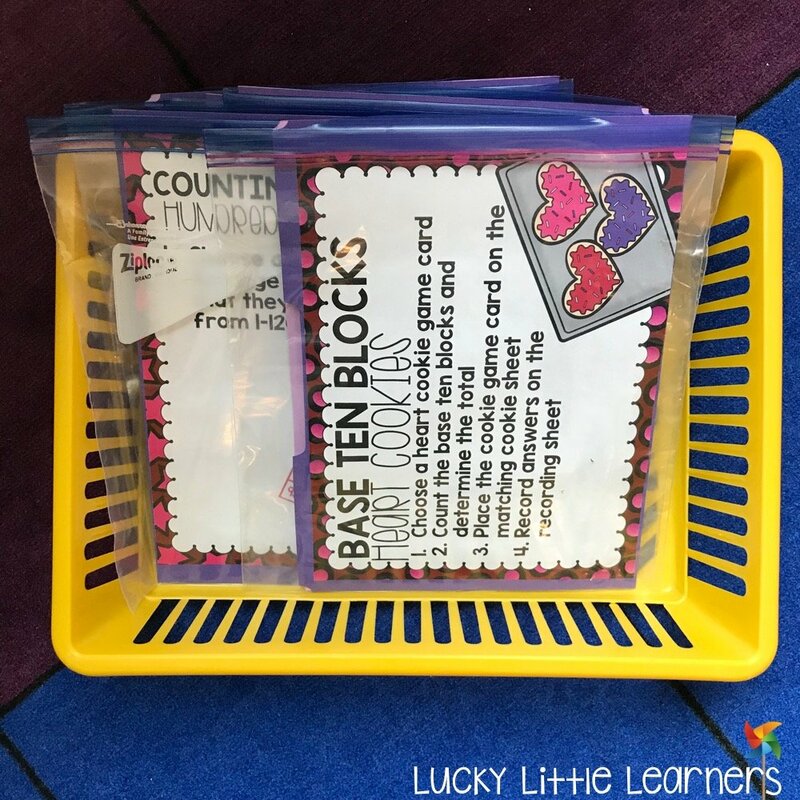 This post is going to go into detail about how to run math centers efficiently and effectively in a classroom setting. First, let’s talk about the math block. The key focus when planning a math block is that the schedule and time is consistent. The example given below shows a 75 minute math block. Teachers are flexible and have to get creative. If you have more than 75 minutes, lucky you! If you have less, you may decide to shorten certain time blocks or even reorganize the structure. So, let’s break this down. Math warm ups are a great way to get the students thinking about math. This can come in many forms and is a short period of time (5 minutes or less). 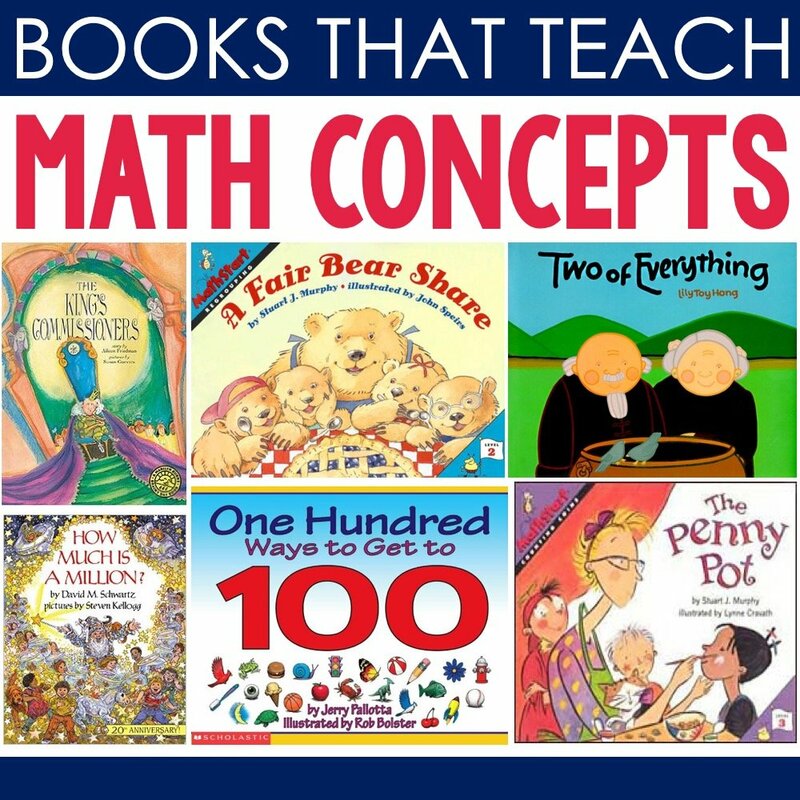 It can be a number talk, partner problem, math fact flashcards, etc. The focus is something that is math related that gets the kids thinking about math. Next up is the whole group lesson. Start with the essential question or learning target. 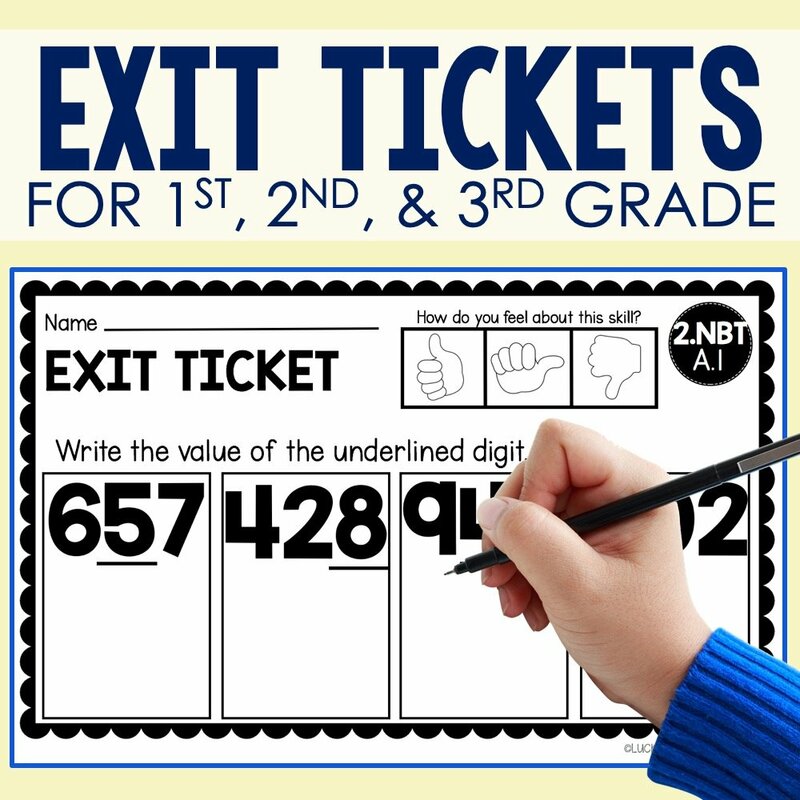 Hook the students in with a song, anchor chart, short math video clip, or story. From there, you are teaching and demonstrating the new math skill for the day. I use the smartboard and document camera a lot during this time. Often times my students have markerboards in their hands and are going through the problems with me. This is a time for a lot of partner accountability talks. I prefer to teach my whole group lessons on the rug because the students are close to myself and the smartboard. I also have them strategically placed on the rug for ideal partner combinations. After the whole group lesson, the students go to their desks to work on the independent practice portion of the math block. This is usually a worksheet from the math curriculum. Sometimes, I choose to have the students complete an interactive math notebook activity instead. During this time, I am at the teacher table or walking around the classroom. Once students finish their independent practice, they bring their paper up to be corrected. I do correct them in the moment because if there is something that they are doing incorrectly, I want to give them immediate feedback and have them fix anything that needs to be fixed. Once students finish their independent practice, they are allowed to go right into their math center choice for the day. I love this because you no longer have to figure out what to do with those early finishers. Math centers is the next part of the math block. I will explain this in further details below. The last 10 minutes of the math blocks is clean up and reflection. 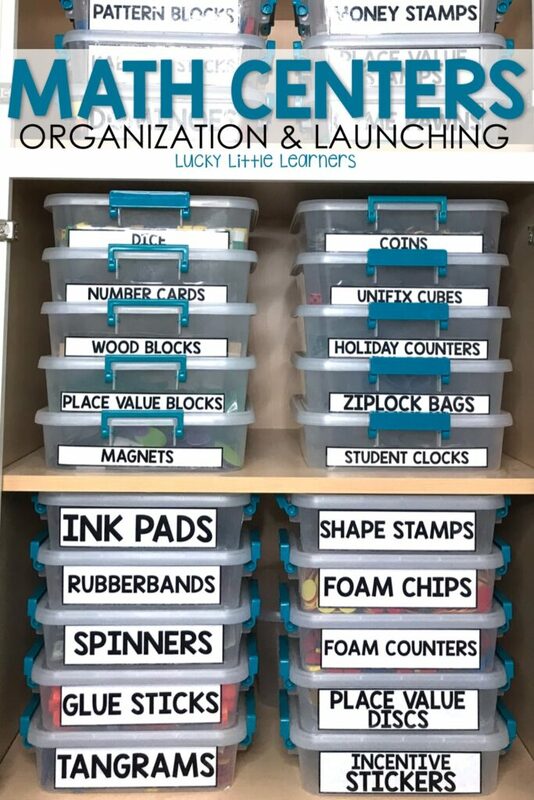 This is a time for students to get the room put back together, organize their math folder, and enter a quick journal entry on how their center time activity went for them. I will explain this in further details below. When launching math centers, it’s important to get this right. 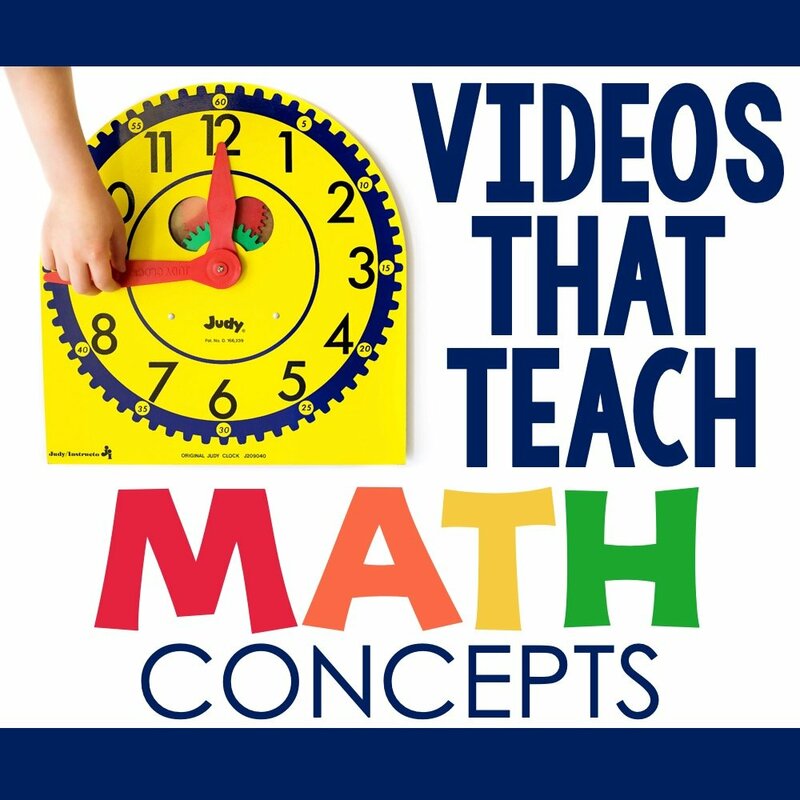 Whether you are launching math centers at the beginning of the school year or even mid-year, it is essential that you go through the necessary steps to lay the foundation for a successful math center time. It takes about 2-3 weeks before we are doing math centers independently. Don’t let this time frame scare you. Think of it this way. You have to learn how to walk before you can run. If the students learn the expectations and practice them to perfection, the amount of quality math time that is going to happen for the rest of the year makes it all worth it. When launching math centers we start with our five expectations that you see below. These are available for free in my Math Centers Launching Freebie. We talk about the 5 rules and discuss what they mean and what they might look like during math centers. For each one I choose a volunteer to demonstrate a math center done incorrectly and then correctly while following the specific rule we are talking about. On day one we talk about all five rules and then the following 5 days we dive deep into each of these by making an anchor chart for each. On the anchor chart we go into more details and at that time we do the demonstrations of what to do and what not to do. The next important thing to establish is the signal you are going to use to get the class’ attention. It can be a clap, lights, doorbell, or even call and respond. Whatever it may be, be consistent. Practice. Model. Demonstrate. What do you want them to do when they hear the signal? In my class we use a wireless doorbell. When the students hear the chime they “freeze and put their hands on their head” and from there they are going to receive a direction. Do what works for you and again, practice, model, and demonstrate. 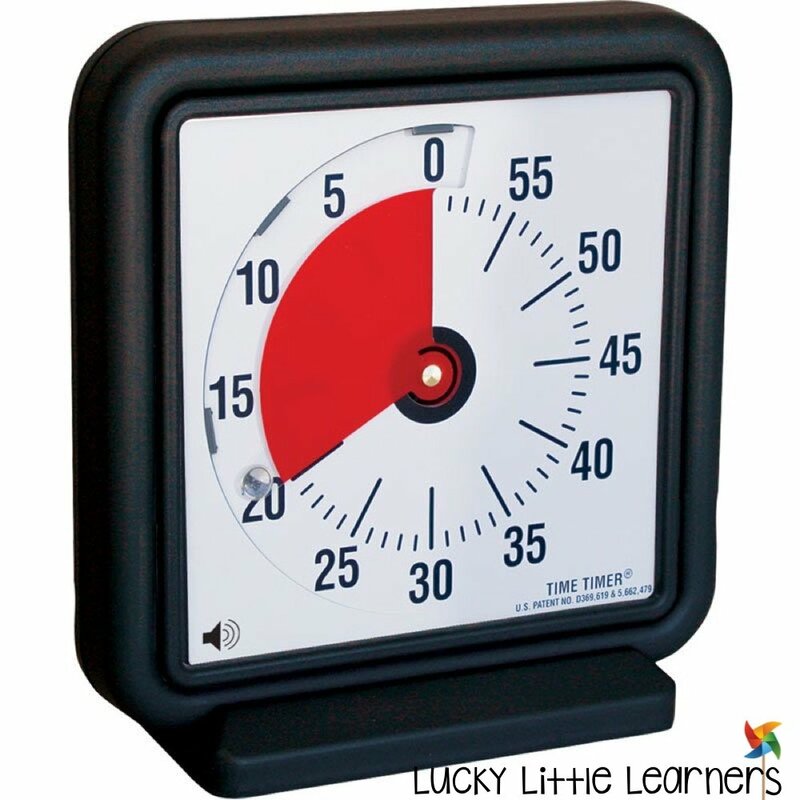 Another important aspect of math centers is a timer. If you want to avoid the question, “How much time do we have left?”, you will want to find yourself a timer. I use a large time timer that sits on my desk. As soon as the first student has finished their independent activity and started their center, I set the timer for the amount of time they have until center time is over. 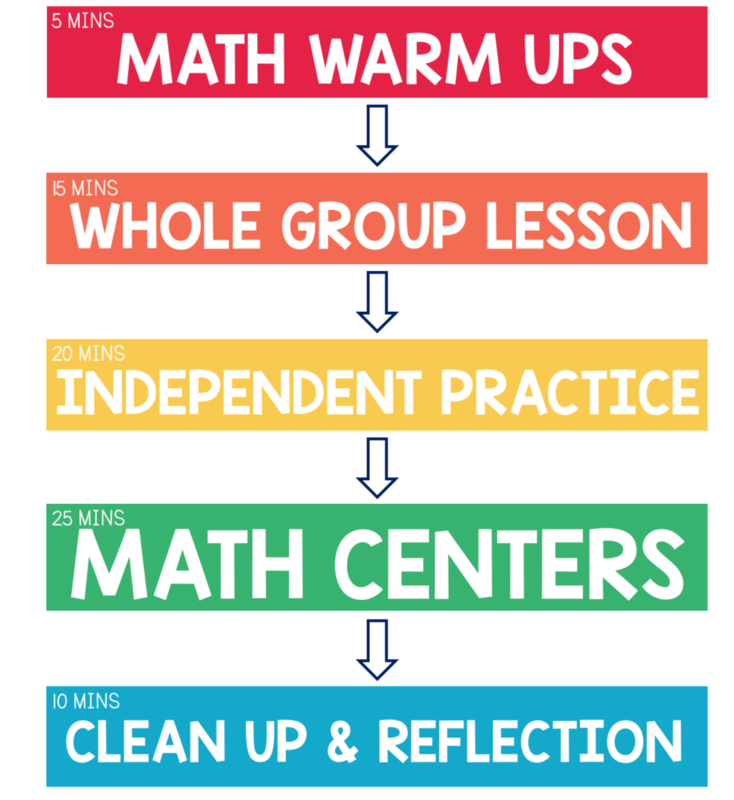 For example, if Student A finishes their independent activity 10 minutes before math center time, I set the timer for 35 minutes (10 minutes of extra time and 25 minutes for centers). I should also mention that in those first 2-3 weeks of training, we are starting with the basics for their center activities. The first week may only be hands on exploring of the different math manipulatives (tools) that we will be using this year. From there, they will learn how to play Toothy, for example, and all the students will be playing Toothy in their center group. All skills that the students are working with during center time are review skills. More information on that below. Baskets are your friend. It sounds silly but this should be a huge takeaway. Every center in my classroom is placed in a basket. If that center needs glue sticks or dice or coins or markerboards they will be placed in the basket. 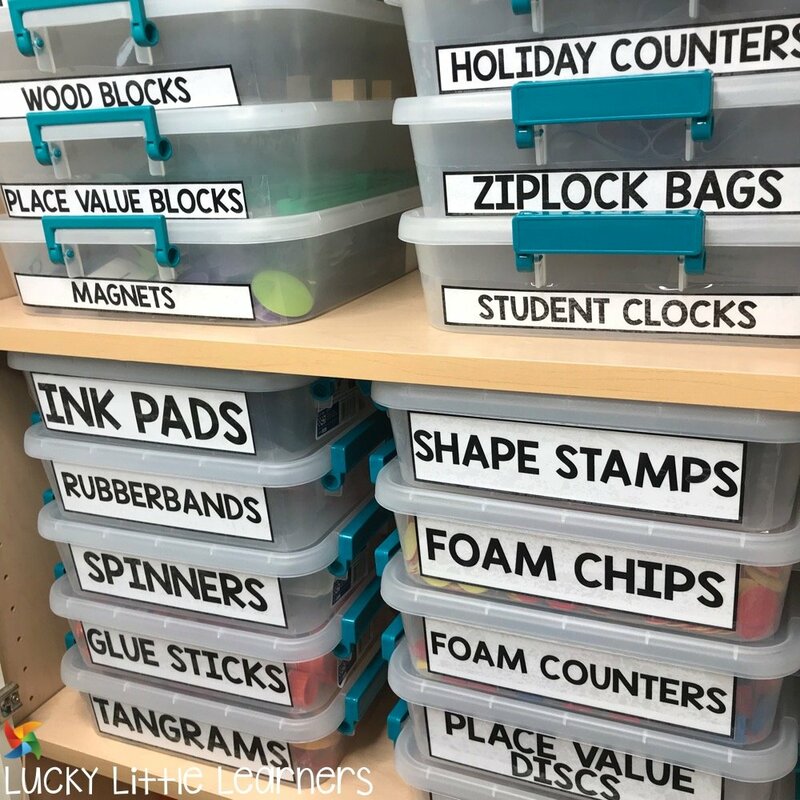 When prepping your math centers, be thinking about anything and everything that the students will need to complete the center. The goal is not to have them coming up to ask you for something when you are working with students. Always keep your baskets in the same place so that the students know where to put them back when they are cleaning up. Below you will see an example of what each of my center baskets might look like. I always try to keep the center activities consistent from week to week. More on that below. Teaching math in the primary grades involves a lot of math tools. I find it’s best to be as organized as possible. It makes the prep time easy and quick. I store all of my math manipulatives in plastic containers that I got from Walmart. You can also get them from Amazon. I like that I can see what’s inside of them without having to open them. I also like that labels fit nicely on the outside for me to quickly grab and go. Math center groups in my classroom are not grouped by ability levels. Let me explain why I do it this way. The math centers that I have in each tub are purposely chosen so that there are a variety of levels of complexity. 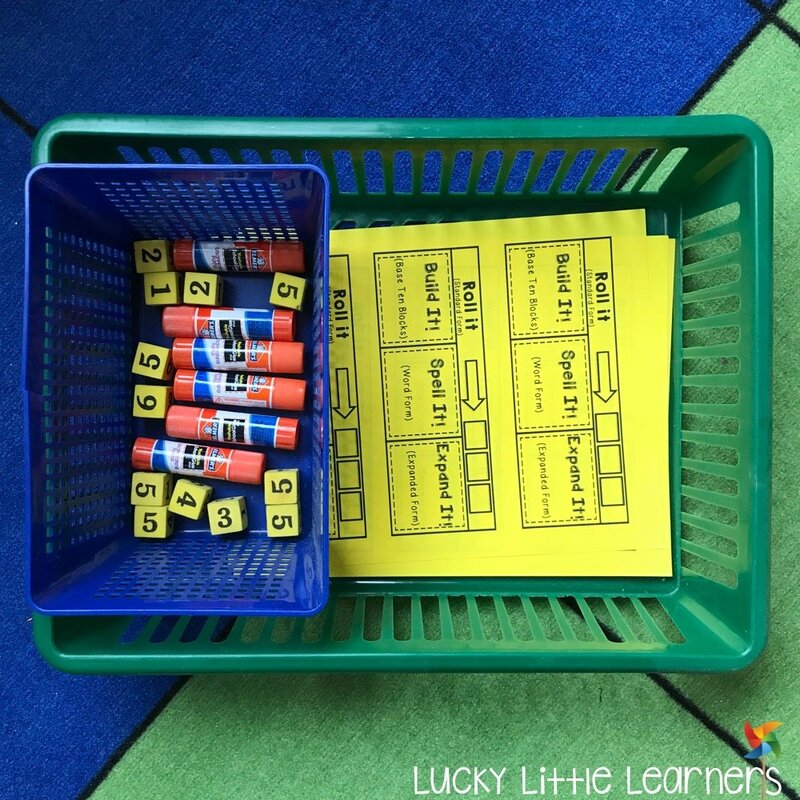 Students are taught to choose “just right” activities from their center basket. If I have six students in a group, there may be 2 below level, 2 at level, and 2 above level in each group. My students are allowed to complete a center with partners. If a student has a question about their center activity, they are taught to “Ask 3 Before Me”. This rule is easy because the groups are mixed ability and the chances of someone in their group being able to help them is very likely. You will also notice from the chart below that “Meet with Teacher” is not a center. The reason for this is because I choose to pull students of my choice during center time. For example, students with a red oval may be above grade level so during center time, I may say “All students with a red oval come back to the teacher table” and then at that time I provide an enrichment lesson. Whatever those students miss during that time does not have to be made up. Disclaimer: Students who don’t finish their independent activity come back to my teacher table first and then I meet with my small group for a lesson. My math center groups are flexible. The math center grouping cards that you see below are editable so at any time, I can assign a student a different card if needed. This file is also available in a digital format for those teachers who prefer to display this on their smartboard. This option is nice for quick editing. I don’t find there to be a ton of movement from shape to shape but there is some. I determine these levels from district adopted pre-assessments that are given at the beginning of every math unit. However, the groups that the students are in for each math center do get changed. I change my groups about once a month or as needed. If I am noticing that the mix of students I have in a center isn’t working well together, I will switch them for the following week. When it is time for the next day’s center rotation, I simply move the name of the centers down one space and the bottom card goes to the top. This process is simple and quick- it takes 10 seconds and has become one of my end of the day tasks before I go home. 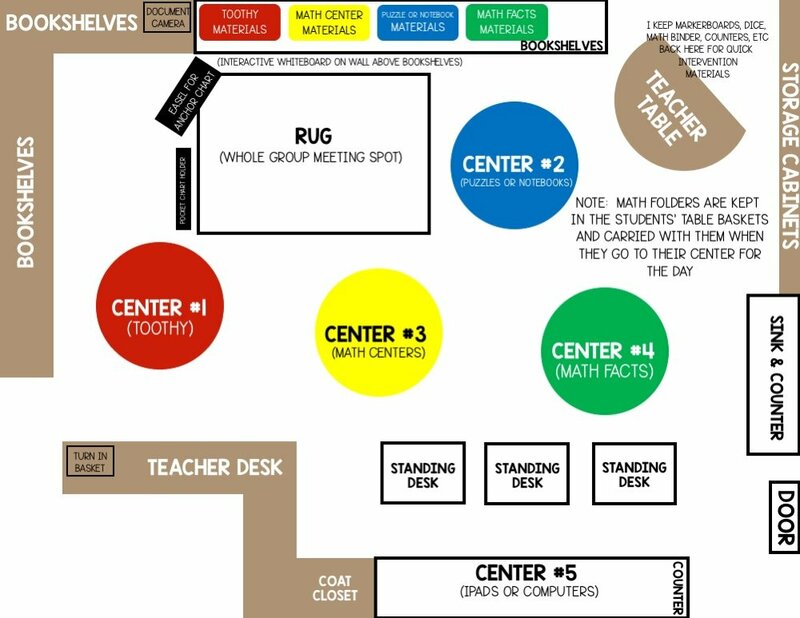 When designing your classroom, one thing to keep in mind is your math center time. I found it to be best to give you a bird’s eye view diagram of my classroom so you can see what I mean. You will notice that my students’ math center baskets match their table color. You will also notice that the teacher table is in the corner and away from the other students’ centers. I do this because it is the least distractible place for them to work and their backs are to the rest of the class. If students are feeling crowded at their table, they do have the option of choosing a “smarter spot” for their center. Some of those spots can be the floor, reading area, rug, or standing desk. They are not allowed to move their center to a different table to work near other students. We discuss “smart spots” during our launching lessons when we are discussing our rules and expectations. Earlier it was mentioned that my math center groups are not grouped according to their ability level. 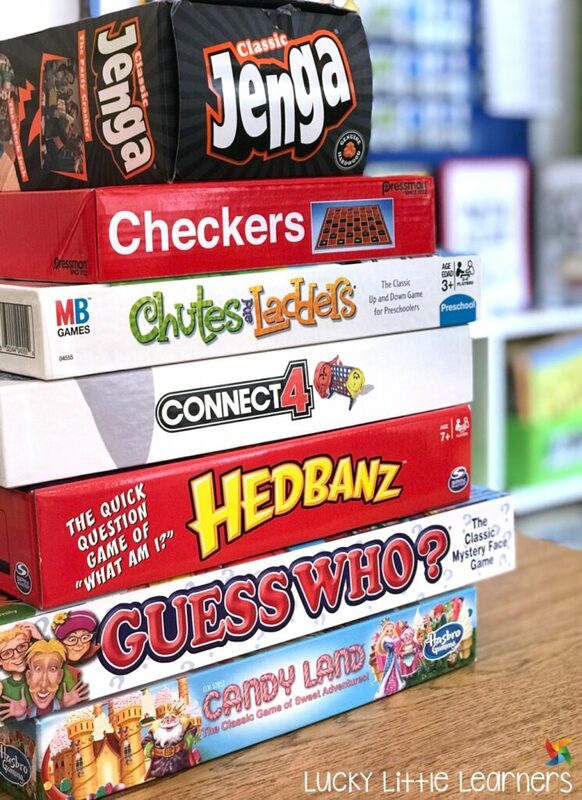 So, that means when my students are working on their math center choices, it’s important to have a variety of levels of skills to choose from. The other key to smooth and effective centers is to choose centers that the students know how to play. Bottom line, this can be achieved by choosing math centers that your students know how to play and the only thing that changes is the skill. Let me explain. Every week I have a math fact fluency center. Sometimes this is their math fact fluency sticks, other weeks it’s flashcards, but most of the time it is our classroom board games. When they are playing a board game, they are playing the game like it’s meant to be played with one exception. Before they are allowed to take their turn, they have to answer 5 math facts on flashcards. This number is not important. You can choose 10 cards if you prefer. The point is, they are practicing their math facts and practicing social skills through the use of our classroom board games. 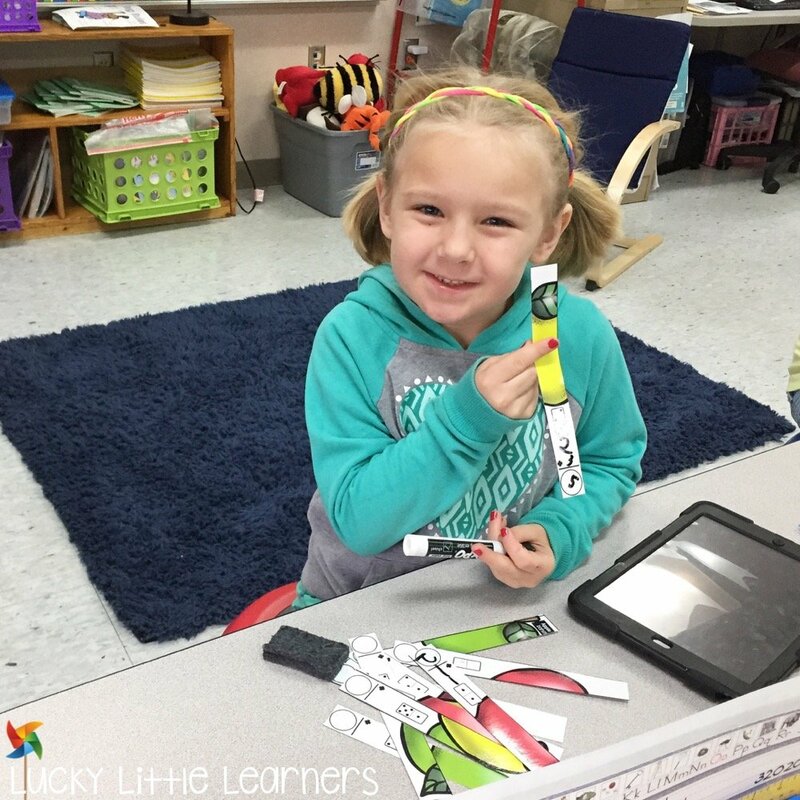 Another option for math fact fluency centers would be math fact fluency sticks. 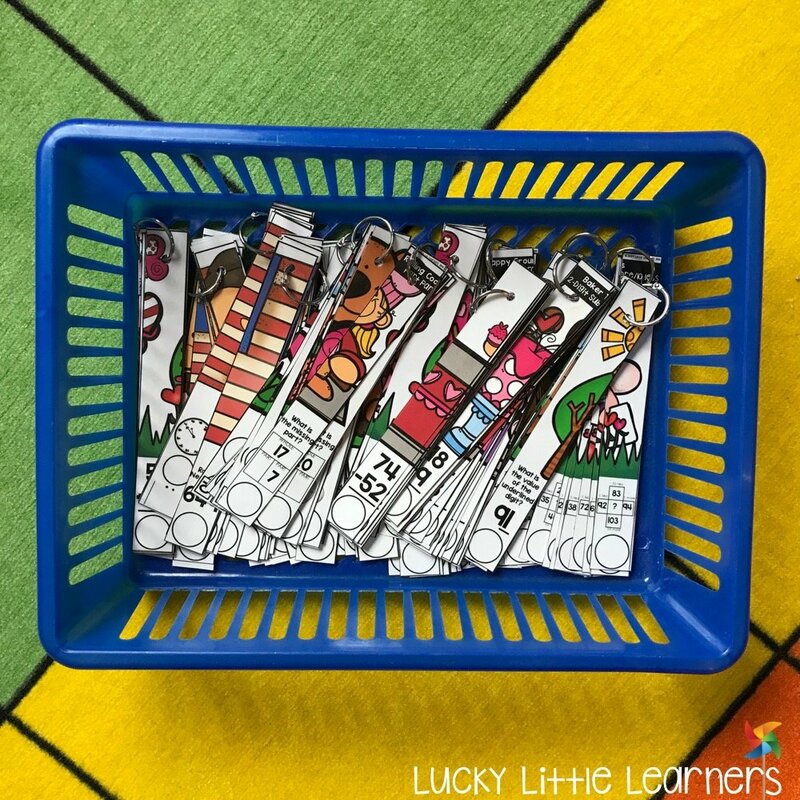 This option is great because the kids have their math fact fluency sticks ready to go in their desk and the math facts that they are working on are specific to them. 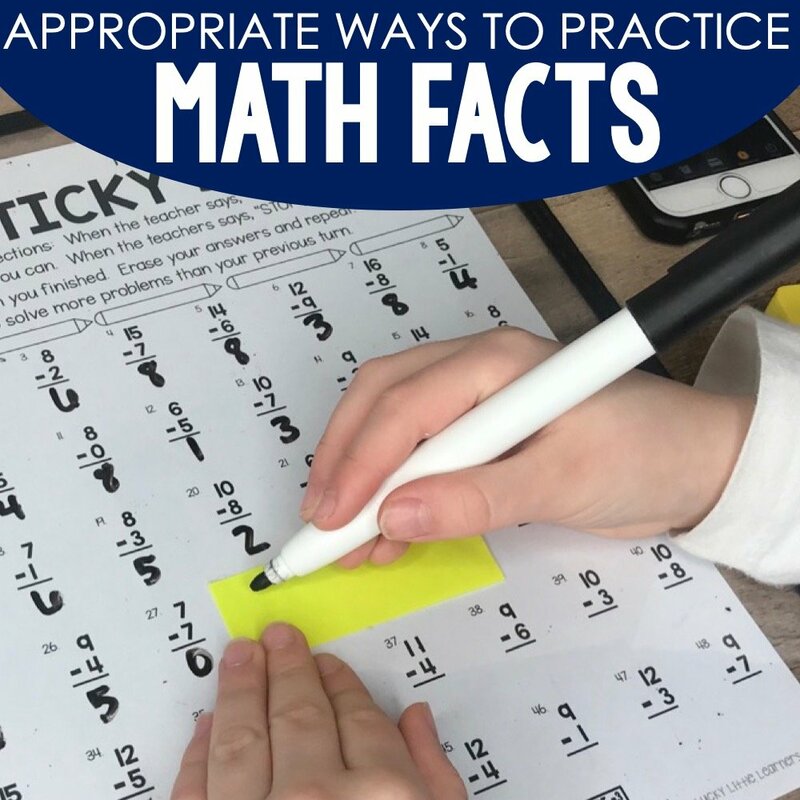 You can see more about math fact fluency sticks in the video below. 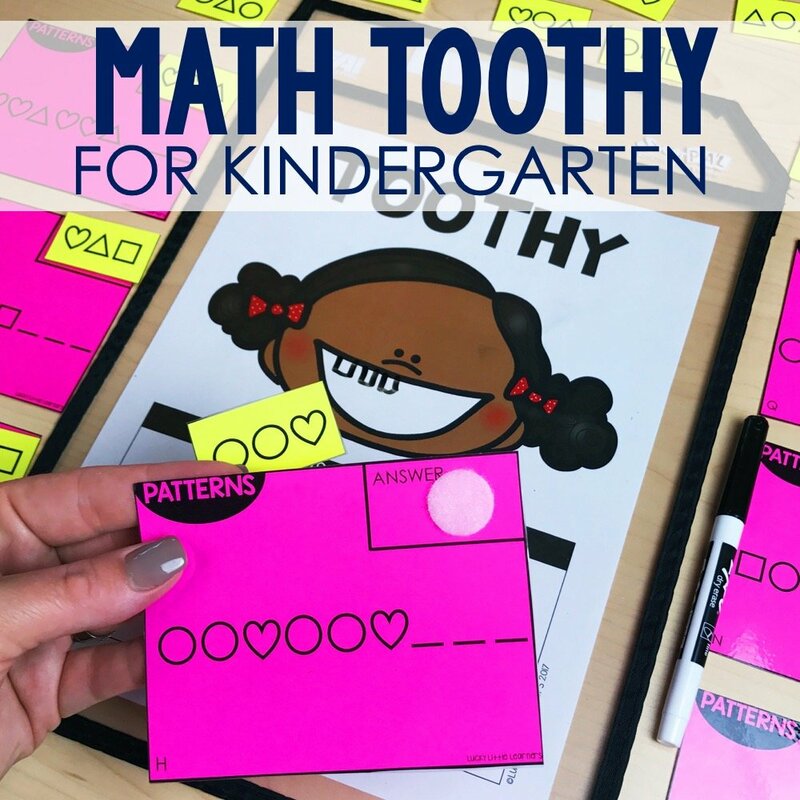 Toothy™ is another option that we have out during math centers. You can read more about Toothy™ in this post. 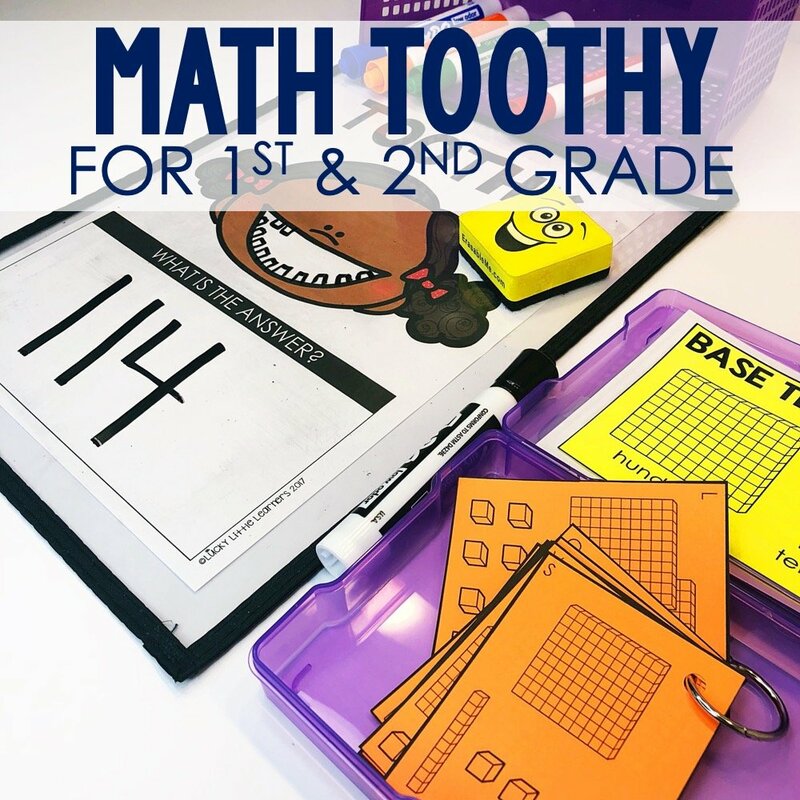 Toothy™ includes 42 different sets of math skills and they are easily differentiated. Toothy™ is completely independent, self-paced, and self-correcting. Students are loving Toothy™ and teachers are loving it too because the rules stay the same but the skill changes. 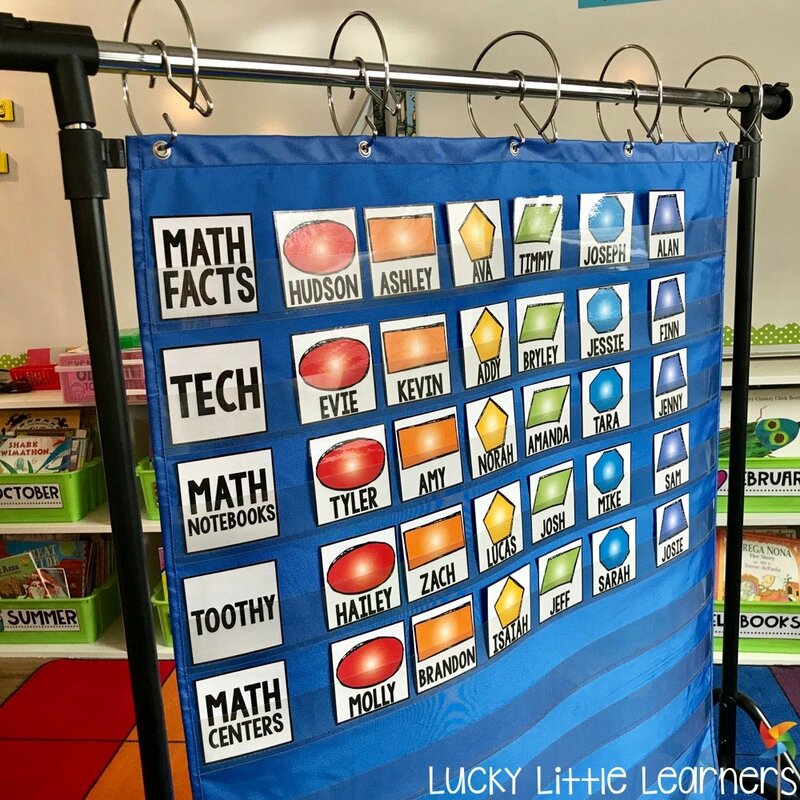 This is a perfect option for math centers because once they learn to play during those launching days, they are set for the entire year. If you want to try out a free sample of Toothy™ click the button below! 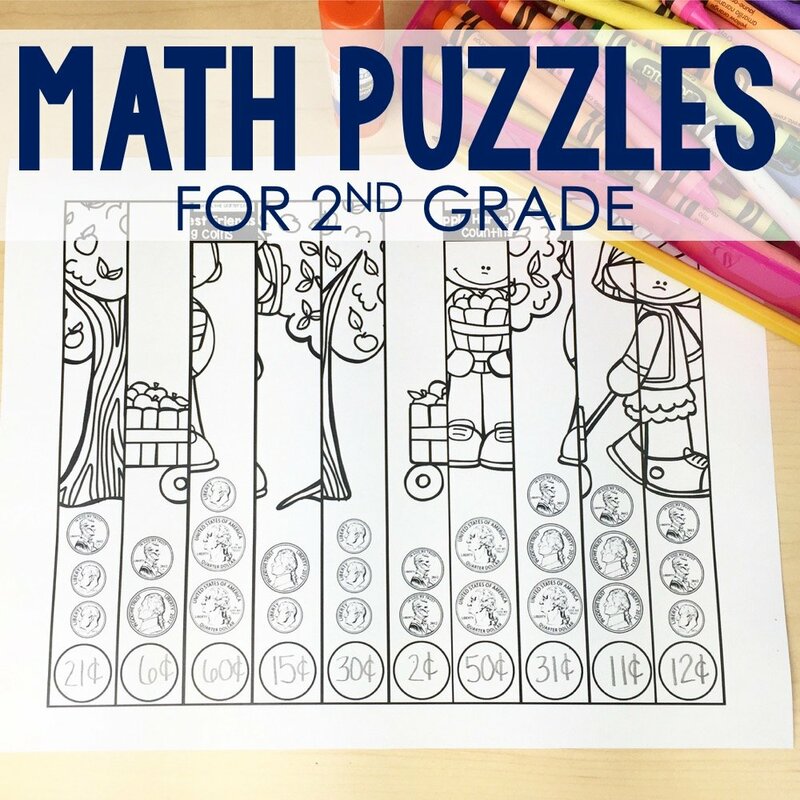 Math puzzles are another popular option for math centers because they are an independent, self-correcting option as well. Each month there are 10-15 different puzzles to choose from and the math puzzle bundle has puzzles for the entire year. The skills progress in complexity through the year but also provide different levels of complexity to allow for differentiation. Math puzzles also have a recording sheet for accountability. The puzzles are available in full color, black and white, student scrambled (for their notebooks), and editable. These are kept in their math center folder. More information to follow about the math center folders. An easy way to implement technology into the classroom is during math centers. Whether your students are using iPads, Chromebooks, or computers there are many free options out there for you students to use during math centers. This post includes some free apps and websites. 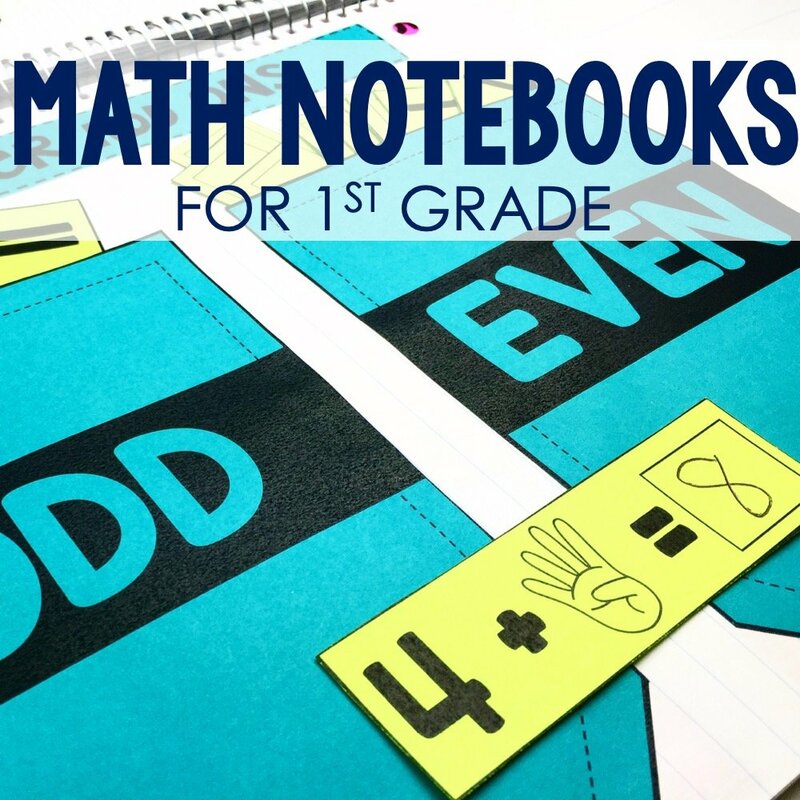 Math Notebooks are an important component of our math block. Sometimes we use them during our independent practice and sometimes we use them during math centers. All of my students keep a math notebook in their table basket. The supplies for the math notebook are found in the center basket. 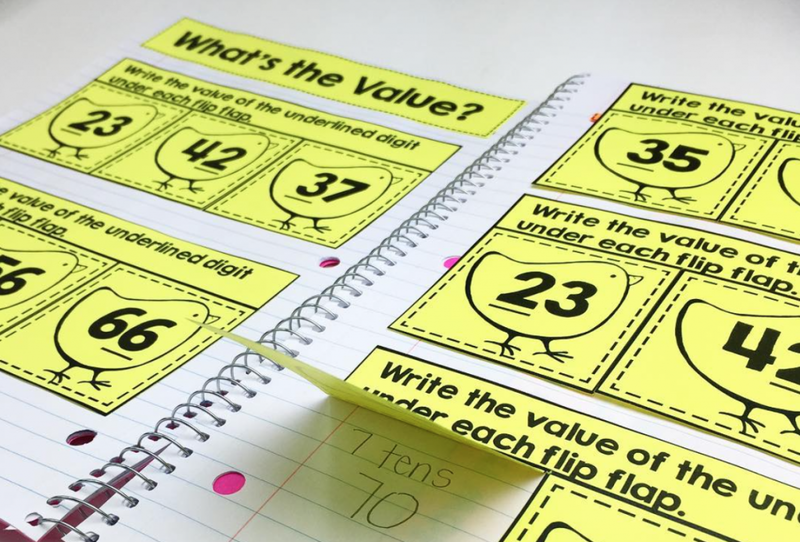 Once the student has finished the activity (also known as the input side) then they can complete the output side of the notebook where they are explaining their thinking, drawing models, and creating and solving their own math problems that pertain to the skill. Monthly math centers are a student favorite! 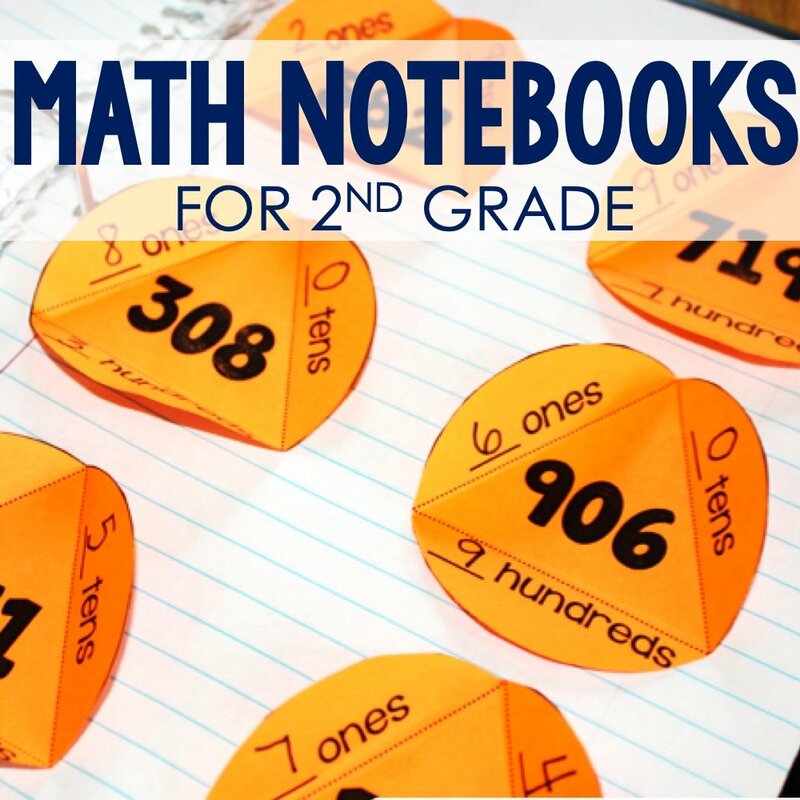 This resource comes with 120 different math centers that are hands-on, engaging, and fun. All math centers come with a recording sheet for accountability and answer key for easy correcting. I keep each math center in a file folder with the direction sheet on the outside and the recording sheets and activity pieces inside. All of this is put inside of a ziplock bag to keep everything together. To see a list of skills that are included in this resource, click on the links below. One of the most common concerns teachers have about math centers is the management piece. Besides visual timers, visual groups on display, consistent center activities, and an official attention getter/signal, the other important component for students is reflection time. This takes a little bit of training during the launching lessons but teach your students how to reflect. 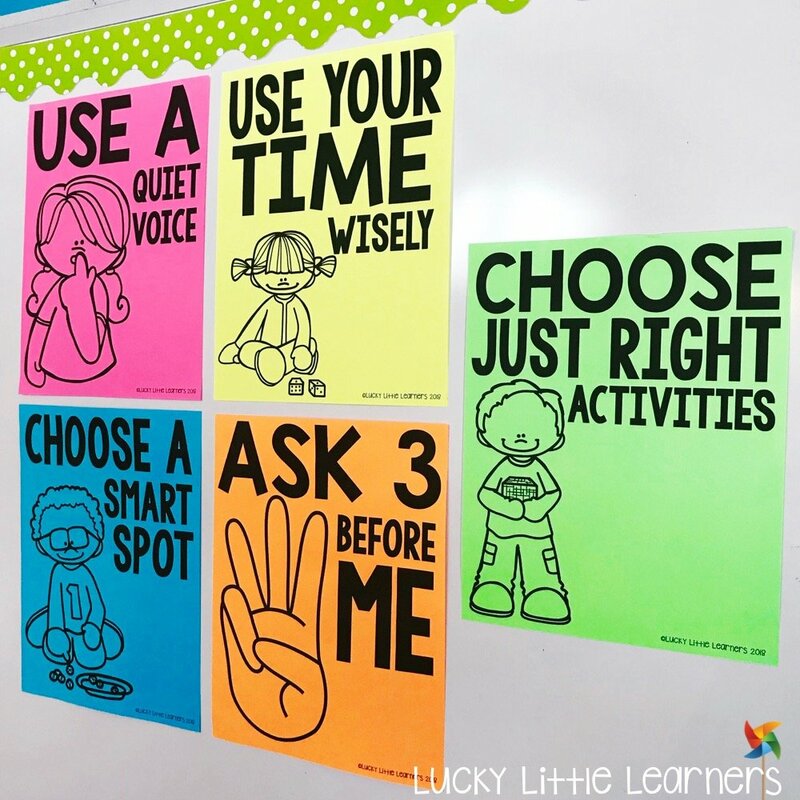 Make an anchor chart if necessary. What went well? What didn’t go well? What was tough? Was anything too easy? What questions do you want to ask your teacher? These types of questions can be answered in the reflection box for each day. We keep these math center notes in our math centers folders. After the students complete their math reflection for the day we have a whole group discussion to wrap up the math block. I ask the class, “Who wants to share something that went well for them today?” “Why do you think it went well?” “Does anyone else have something to share?” “Who has something to share that they felt didn’t go well?” “Why do you feel that was a struggle?” “What could you have done differently?” This open dialogue is not something that comes naturally to students but with time it develops and becomes a very valuable piece of the math block. 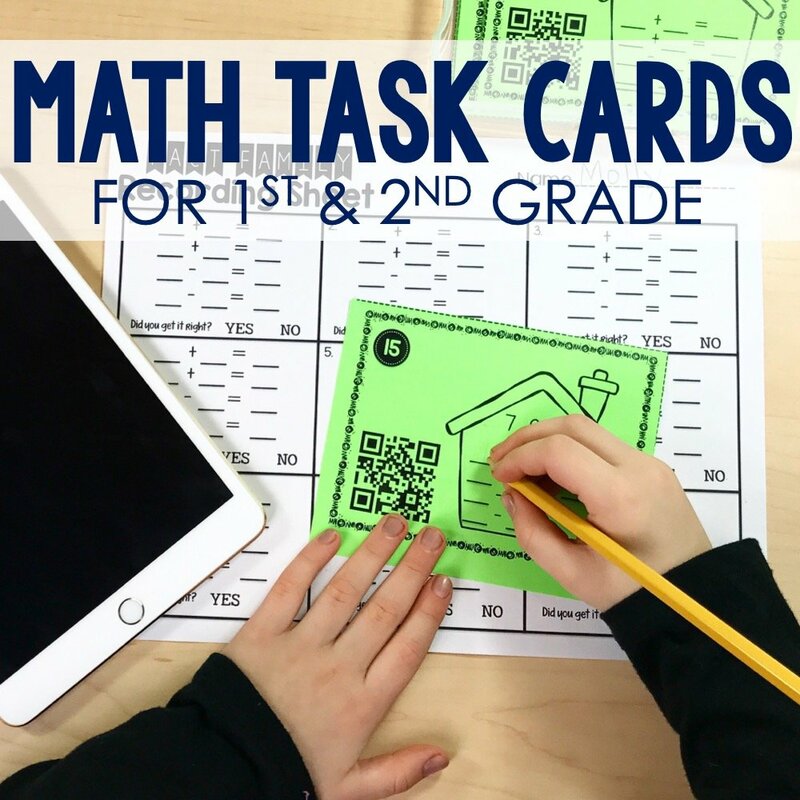 There are so many lessons that students learn during this time of the math block. 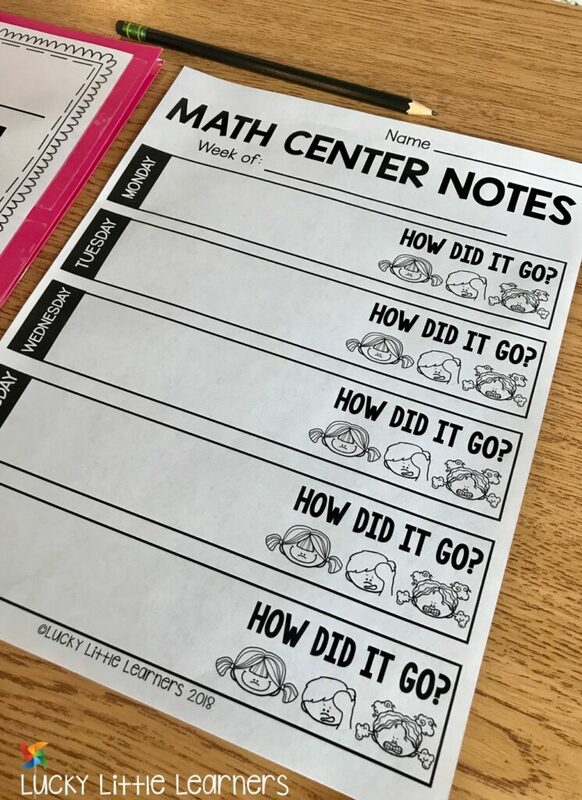 These math center reflection notes can be found in this free download. Do you correct the center activities? Short answer, no. Feel better? But seriously, I do spot check their recording sheets to make sure that the skill they are practicing is overall accurate. Most of my centers are self-correcting which provides the students with the immediate feedback. The rest can be spot checked since they are always review skills during center time. Can I do centers if I am the only teacher in the room? Yes! So often teachers shy away from implementing centers because they don’t think they can do it alone. Those launching days are key. Don’t rush the launching process. Practice. Model. Demonstrate. Repeat. What do I do about students always needing to ask me questions? The “Ask 3 Before Me” rule is key! Stay consistent with this rule. If a student comes to you with a question, ask them to tell you the three people they asked before coming to you. If they did ask three people, chances are their question would benefit everyone. Answer their question, write it down, and talk about it during reflection time since others are probably wondering the same thing. How do students know which activity to choose? During the launching days, we go through examples of different lessons. We talk about what makes a “just right” activity and what doesn’t. I tell my students that if they choose an activity and they can’t answer 3 questions in a row, it’s too hard. On the flip side, if they are breezing through the activity with little to no effort, it’s too easy. I have seen some teachers use a sticker system. They will use a different color for each level of activity and students know which color to look for. This is also a great option. What if my math block isn’t 75 minutes long? This is not a requirement for math centers. You may have to shorten your math center time to 20 minutes and your reflection time to 5 minutes just to give you one example. Is it okay to have different amounts of kids in each center? What do I do if my class can’t handle math centers and working independently? This all comes down to training. Yes, some years are tougher than others. Bottom line, when things aren’t running the way you have trained them to do math centers, stop them. Go back to the rug. Talk about it. “Why do you think we had to stop our math center time?” “What should this have looked like instead?” “Can someone show us how this looks?” “Let’s try it again except this time I want you to show me ______.” Be consistent and follow through. If you have to stop 10 times to discuss and try again, do it. If you have to go back to reteach launching, do it. Worst case scenario, you do all this and you still have one student who can’t do this correctly, they are now going to work at the teacher table next to you. What is a math center folder and what goes inside of it? Math center folders are a place for keeping all of you students math centers “stuff.” Inside of this folder is a packet of their recording sheets, their math notebook, a student anchor chart of the math centers expectations, and any unfinished work they have from their independent activity. 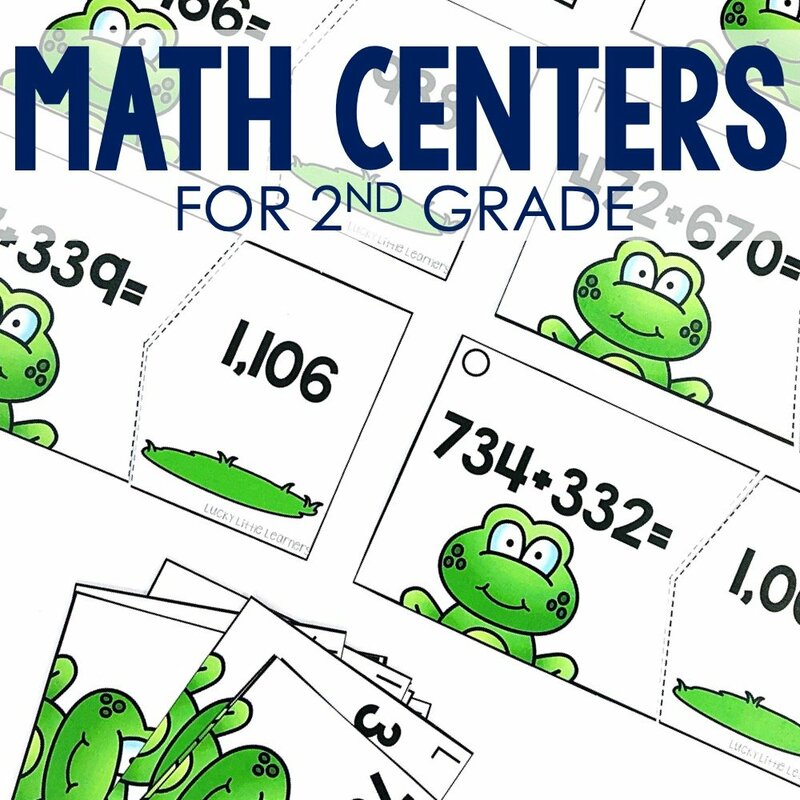 You can download a free math center folder file here. What is the teacher doing during math centers? During math centers the teacher is, first, working with the students who didn’t finish their independent math worksheet. Once those students are done, the teacher selects a group of students to work with either for intervention, extension, or enrichment. The other option for the teacher during this time is to conference with students. For example, if there’s something that you want to discuss with a child about their reflection notes in their math folder, this is a great time to do this. Another option for math conferencing is setting goals. One of the goals that my students work towards is their math fact fluency scores. Math centers is the perfect time to pull students to the teacher table to check their math fact fluency that are being tracked on their math fact fluency sticks. What if my math block doesn’t go as smoothly as I want it to go? 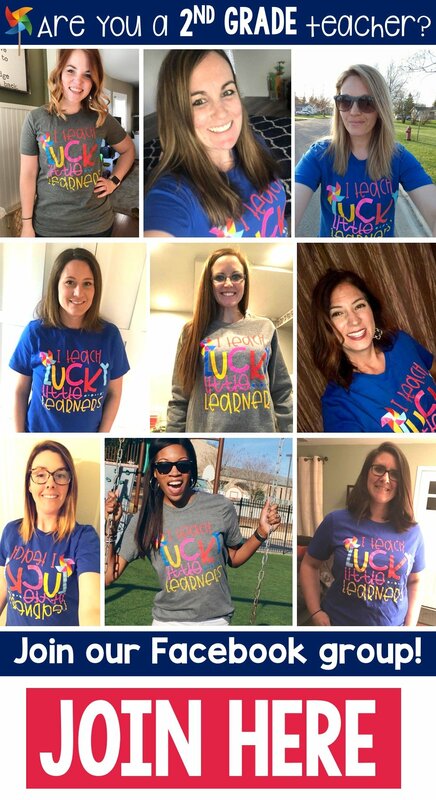 Here is where I wish I could be in your classroom to be your cheerleader. Nobody is perfect. No classroom is perfect. There are going to be bad days and there are going to be great days. Don’t be too hard on yourself. Trust your gut. Do what’s best for your kids. You are doing a great job. If something doesn’t go well, make a mental note, make some changes, and try it again tomorrow. You’ve got this! Feel free to use the image above to pin to your Pinterest board or click here for the link! Angie, you inspire me to be an even better teacher so thank you! I also was wondering, how do you handle students who take longer on the independent practice and therefore have less time for their center? Do you have them finish it the next day or later? Hi Courtney! Thank you for your sweet words! I explain this a bit more in the FAQ and flexible groups section of the post but students who need more time to finish the independent task go to the teacher table before they can go to their center. Typically, these are the students who need the extra help anyways so having them come to the teacher table allows for me to break things down step by step and include manipulatives and marker board practice if needed. When they finish with me, then they can go to their center. 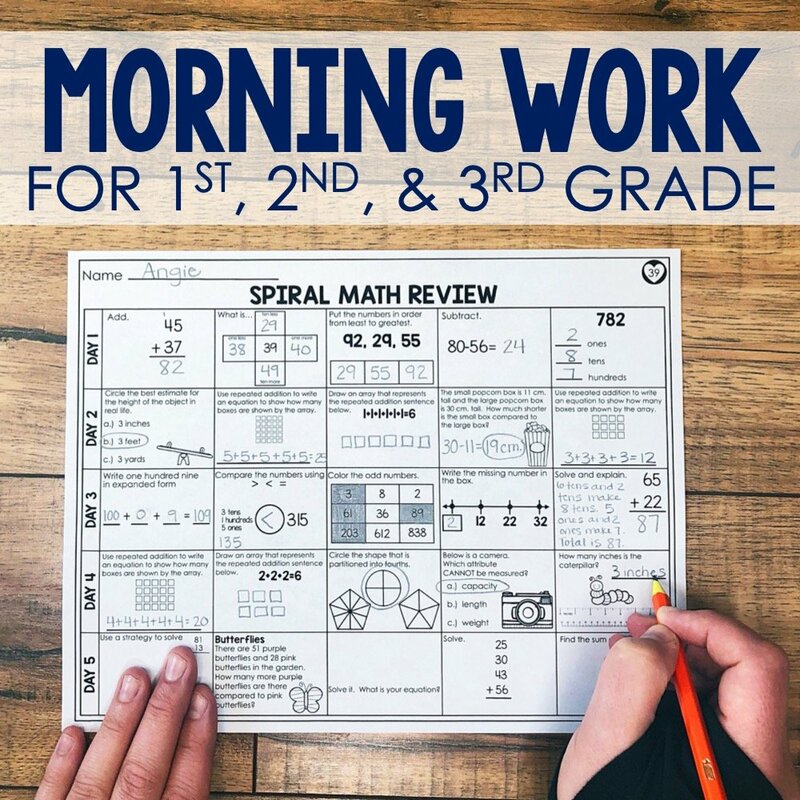 The centers aren’t something that I expect them to finish since they are a spiral review of a math skill they should already know. Hope that helps! Thank you for posting this blog! 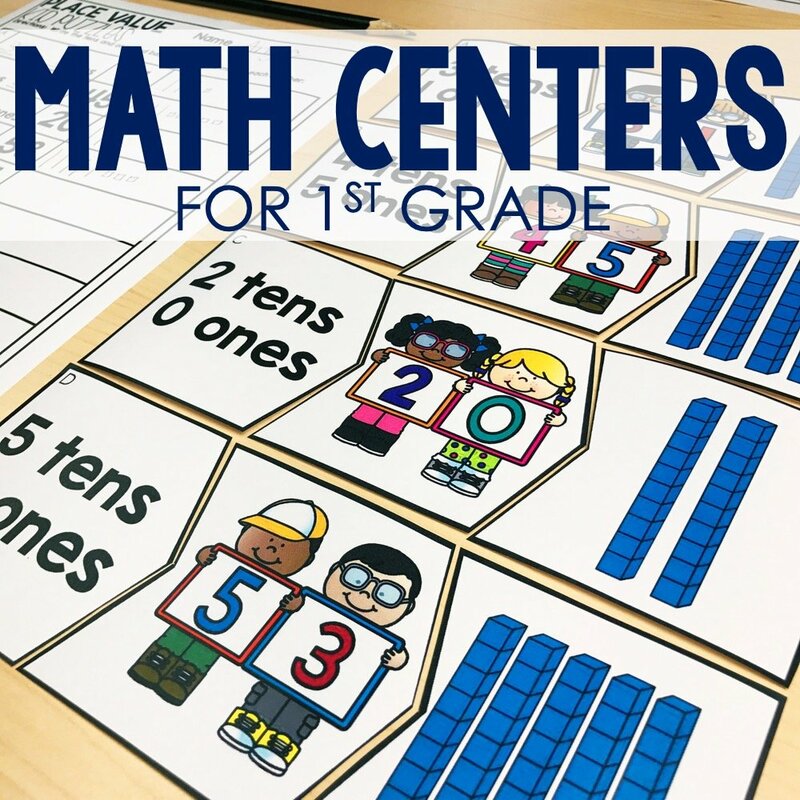 I am currently using math centers but looking for ways to make it even better for myself and my students. 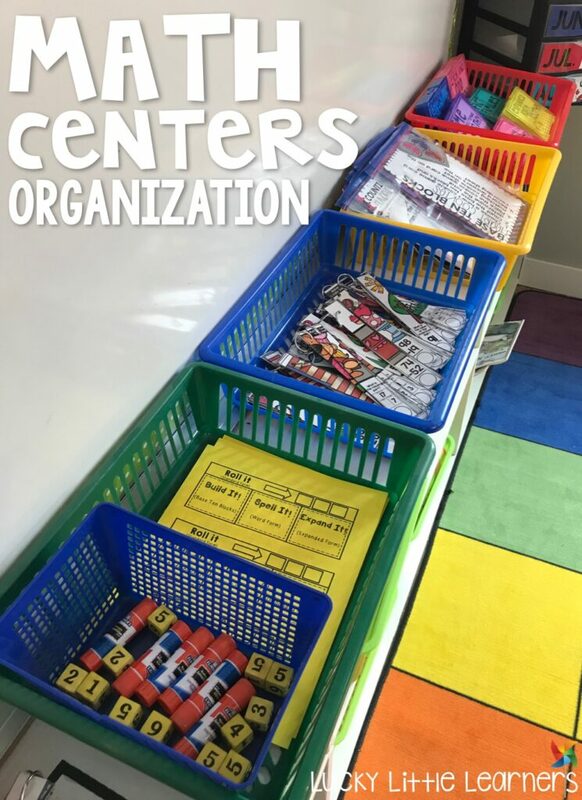 Since you have 5 centers.. do students complete all 5 centers within that time, or 1 center per day since you move the names of the centers each afternoon? I’m just thinking how long each center should be and how often they move to the next? Hi Caitlin. Thank you for your message. With this structure, students are going to once center per day and they do this five days a week to get to all the center choices. You can read more about this in the math block and flexible groups section of the blog post. Hope that helps! Wow!! Thank you for sharing all this amazing, organized and detailed information. I am going to start getting things to enhance my stations. Hi Mary Jo. Thank you for stopping by and for taking the time to leave a comment! I’m glad that this information was helpful! Thank you so much for this! As a first year 1st grade teacher, I have been struggling with centers, both ELA and Math. I have help coming from my district and mentor next week, but this really helped me see how to plan, organize, and implement centers. Awesome, Adrian. I’m glad that this post was helpful for you. It’s definitely a structure that can be very overwhelming if it’s not implemented and ran the correct way. 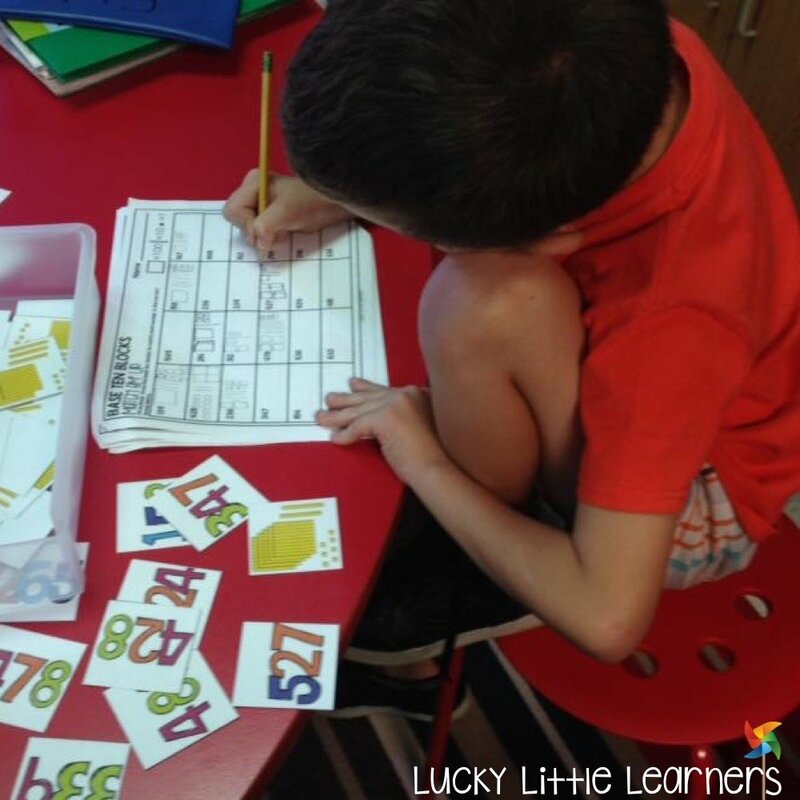 The nice thing is that there are many ways to adjust math centers so that they work for you. Best of luck and thank you for taking the time to stop over to read! Great read. Beneficial even for this fourth grade teacher!!! Thank you! Awesome! I’m glad to hear that this is helpful! I LOVE your math centers! I have been starting to implement them in my first grade classroom this year and the kids love them too! Do you offer editable name cards (the ones with shapes) to be purchased? I really like how you have that set up. Thanks! I do offer editable name tags in my shop, I have placed a link below to where you can purchase them through TpT if they are what you’re looking for! Thanks fo reaching out, I hope this helps! So the students only do one math center each day? Yes, that’s what I do in my classroom but each classroom should do what works best for them. Angie, thank you so much for taking the time to document all of this! 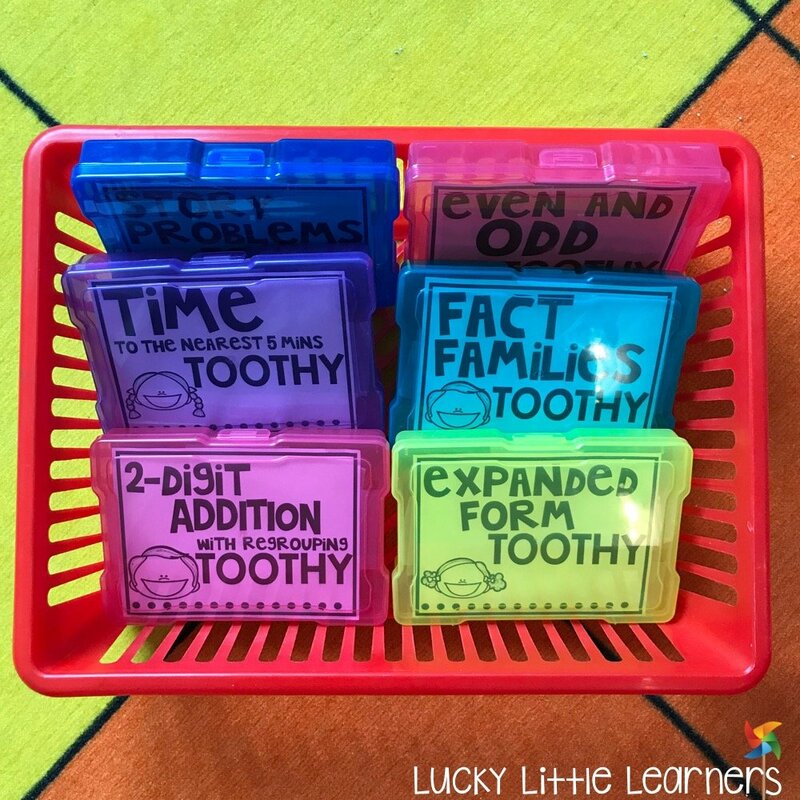 I have the Toothy bundle and the Math Centers bundle, but just added the Notebook bundle and Fact Fluency Sticks to my Wish List. I’m so excited to implement your plan! Thanks for providing this resource. 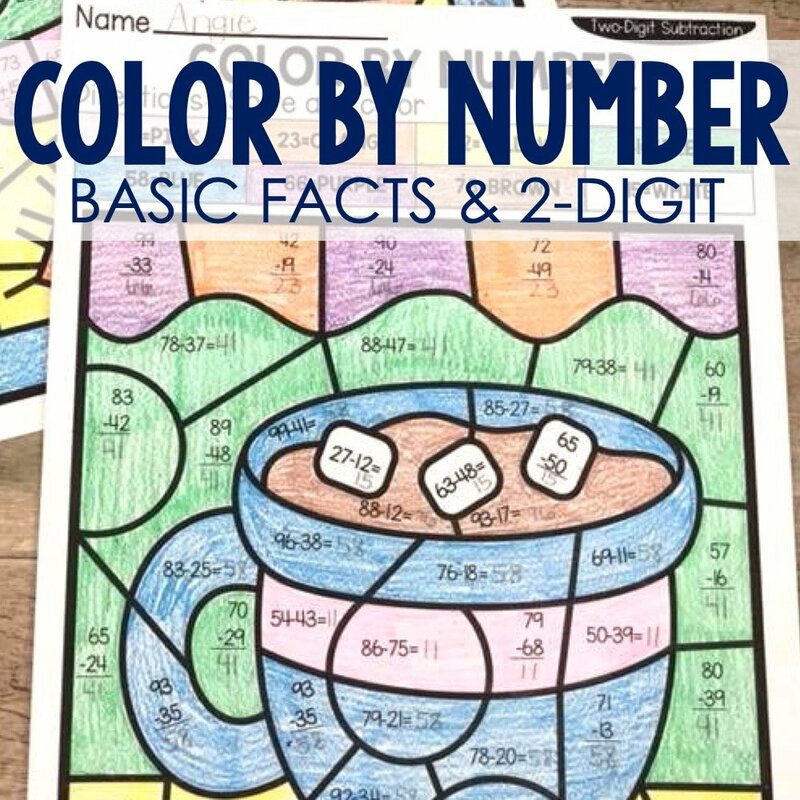 I have been doing your Math Centers all year, but want to incorporate some of the things I learned in this blog. For example, I would like the Center Rotation chart but cannot find it anywhere. I am wanting to start it Monday. Thanks! At this time the links to the free downloads are not working. I have purchased your math centers and would like to access these items as well please. I appreciate all and any help that you can provide. Thank you! 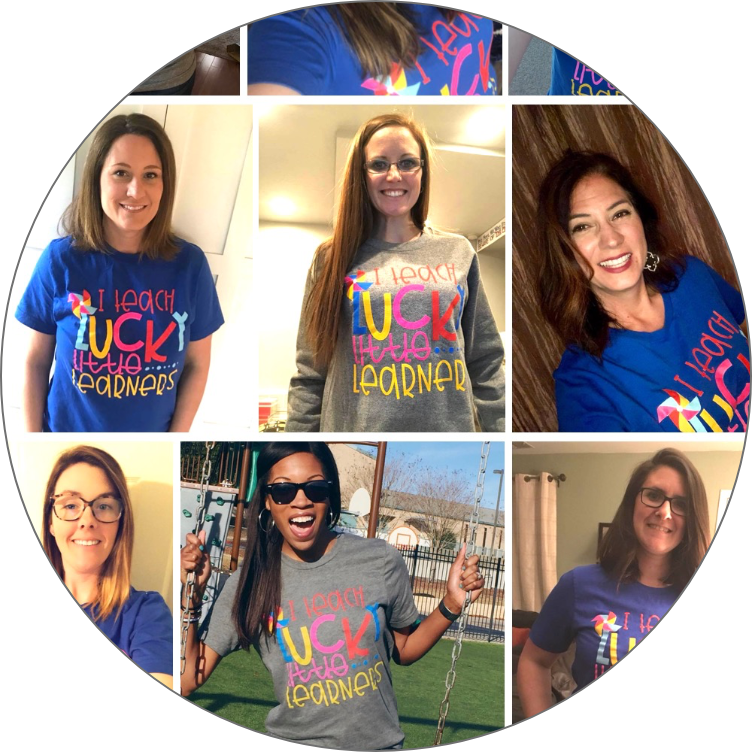 You can email me at angie@luckylittlelearners.com with any questions you may have about these links. Hopefully I will be able to help you sort this issue out! Thank you! I just love your 2nd grade math centers! 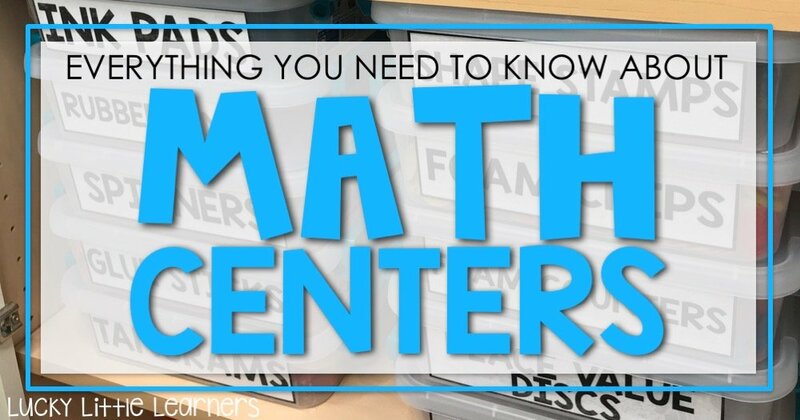 I will be moving to 3rd grade, are you planning on doing math centers for 3rd grade? Thank you for your message and purchase. I also appreciate you taking the time to message me with your great suggestion. I will add it to my list and do my best to get to it. Have a great day! Angie, looks like the links aren’t working for the two freebies here: Math Center Launching Freebie and Math Center Notes. I would love to use them in my classroom. Can you either fix the links or email the resources to me? Thank you so much! You can email me at angie@luckylittlelearners.com and I will set you up with the correct links for these freebies. Thank you! Just wondering if you have any tips on the technology center–do your students complain that they only get do it once a week? Technology seems to be the only center that the students get excited about and get upset if they don’t get to do it every day. Thank you for your wonderful ideas! How do you get the free Math Center resources? It will not let me type my email address. When you click on free download link it takes to the video. You can email me at angie@luckylittlelearners.com for the freebie or for any question you may have about this link! Thanks so much!